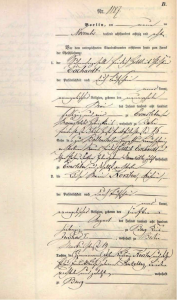 Author’s Note: If you are interested in more tricks for deciphering old German handwriting, check out our popular book on the topic, or if you want to learn the handwriting yourself, sign up for our brand-new online course. Ich habe deinen Brief erhalten/bekommen. I received your letter. Seid herzlich gegrüßt. Literally: Be greeted affectionately. English: We send you our warm regards. Vielen herzlichen Dank. Many warm/heartfelt thanks. Wir sind alle gesund. We are all healthy. As discussed in the first post, abbreviations also appear frequently in old German documents. The most common abbreviations include: “d.”, meaning “den” (the) before a date, as in “d. 2te February (the second of February), “u.” for “und” (and), and “geb.” for “geboren”, meaning “nèe.” The meanings of other abbreviations can be found using this site – although if you don’t speak German, have a dictionary handy! * “N” and “St” – These two letters are very similar and are often difficult for even a professional to tell apart. If you look closely, however, you can see that the bottoms of the two letters are (or should be) different. The “N” finishes with a swoop to the right, while the “St” finishes with the crossing of the “t” itself. However, in actual documents, this can still be difficult. The 1920s example of “St” in Stunde (hour) on the bottom also finishes with a swoop to the right and thus even more strongly resembles an N. Here, however, you can differentiate it from an “N” in the fact that the “t” is (slightly) crossed, as opposed to the “N” in “Nachmittag” (afternoon) above. * “v” and “w” –These lowercase letters look similar, but are actually quite easy to tell apart. While they both have the loop on the right, the “v” only has one stroke before the loop, while the “w” has two. Below, “v” is on the left, with a real-life example of the word “vielen” (many). “w” is center, followed by an example of the word “wird” (will). Finally, the last column shows both letters in the words “verkauft werden” (will be sold). 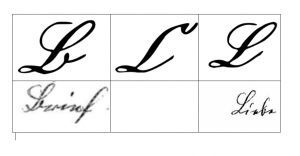 Notice how the “w” has one more stroke before the loop than the “v” in this sample from an 1868 letter. 3. Understand the importance of occupations. As we are to some extent today, our ancestors were also defined by their occupations. Therefore, on any certificate, the occupation of a person was listed before the person’s name. For example, a certificate may read that “the farmer Johann Schmidt appeared before the undersigned registrar”, with farmer (Bauer) preceding the name of the person involved. These levels, if listed, always follow the name of the occupation. For example, “Schuhmachermeister” is a person who is a master shoemaker. In the examples below, Friedrich Gottlieb Christian Eckhardt was a Schuhmachergeselle (first handwritten word, top image) before he was a Schuhmachermeister (last handwritten word, top line of bottom image). 4. Think horse-drawn carriage driver. Speaking of occupations, many occupations that were around in the past are no longer around today. Or, if the occupation is still around today, there may have been a different word for it in the past. This website provides an A-Z list of old occupations with their modern-day German translation. 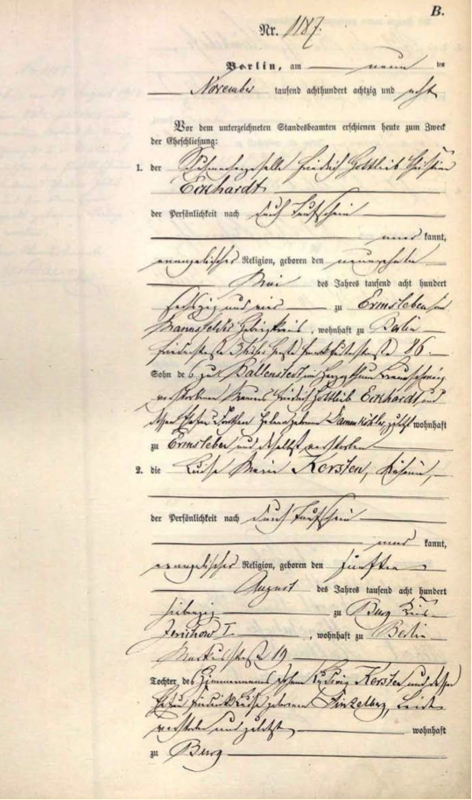 If you don’t speak German, you can find the old-fashioned occupation of your ancestor in the left column, and then use a dictionary to translate one of the modern day names in the right column. In my experience, the most common occupation for women seems to have been “Näherin” (seamstress), while the most common occupation for men seems to have been “Bauer” (farmer). Edna M. Bentz’s book “If I Can, You Can Decipher German Records” has a great list of old-fashioned occupations as well. 5. Expect the unexpected. And by this, I mean that words may not be exactly as they are in the dictionary today. Just as our English speaking ancestors used words such as “thee” and “thou”, our German speaking ancestors used different words as well. If you transcribe a word and have absolutely no idea what it means, it could easily be a word no longer in use. This website offers a great German-German dictionary (started by the Grimm brothers) for old-fashioned German words. In the above example, the author of the letter writes “ich aich noch nigt” instead of the proper German spelling “ich euch noch nicht” (part of a sentence, literally “I haven’t…you yet.”) The “eu” is consistently replaced with “ai” in this letter and the “ch” with a “g”. Once you start to notice the common mistakes an author makes, you can identify these substitutions in other words in your document. 6. Keep on an eye on those Americans. If your German ancestors were in America, they might have included English words and place names in their letters. I’ve come across “Varmer” (farmer), “Kolorata” (Colorado), “daler” (dollar), “vor schur” (for sure), and so on. So, if you cannot recognize a German word, take a step back and ask yourself if your ancestor could have been using some of their newly learned English. 7. Be street smart. The word for street in German is “Straße”, often abbreviated “Str.” If you know that a word in your document is a street, but can’t figure out which street it is, use this website to help you out. You type your ancestor’s city in “Suche im Strassenverzeichnis”, which then pulls up a map of the city and an A-Z list of street names. If you know at least some of the letters in your street name, this can help you recognize the correct transcription of the word. 8. Don’t be fooled by “normal” script. Names of people were often written in normal Latin script, just as the cursive script we use today. It is important to be aware of this fact – for example, you don’t want to see a letter “e” in a name and think that that is how an “e” is written in the rest of the document. Much the opposite – names were often signed one way, while the body of the document was written in Kurrent. This is especially true for church book registers. 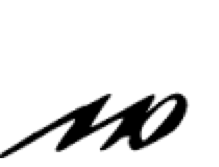 In the example below, the author signs her name (Louise H) in “normal” script. You can see that there is no swoop above the “u” as in Kurrent, the “e” at the end of Louise is more like our cursive “e” than the Kurrent “e” that resembles our modern “n” and the “H” is nothing like the complicated Kurrent “H” that goes both above and below the line. However, in the rest of this document, the author would have used the Kurrent letters. 10. And finally, and most importantly, know when to take a break. You’ve almost finished your transcription, but there is still one frustrating word that you cannot figure out for the life of you. You want to persevere and finish, but my advice is: don’t. Take a break, and things will often look much clearer if you stop and come back later. I’ve experienced this a number of times: The transcription is just about finished, but that one last word is baffling me. I take a break, come back later or even the next day, and all of the sudden, the word is perfectly clear and I wonder how I didn’t see it before. As a linguist and not a scientist, I can’t explain how that happens, but it amazes me every time! And that’s that! With these ten tips, in addition to the original Ten Tips for Deciphering Old German Handwriting, you should be well on your way to battling the handwriting of the past. And once again, if you would like a professional to translate your documents, I’d be happy to help – contact me at language@sktranslations.com. Image Credit: All original samples have been published with the permission of the client. All Kurrentschrift letter samples are from the Kurrentschrift wikipedia page, except for “N” and “St”, which can be found here.